Properties built before 1978 are subject to Federal and State regulations regarding Lead-Based Paint Hazards. Requires disclosure to prospective purchasers and renters of any knowledge the owner has of a lead-based paint hazard. Requires that purchasers be allowed a 10-day period to study for lead-based paint hazards, commissioned by the buyer and at the buyer’s expense. 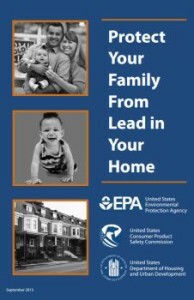 Requires that owners give to tenants and buyers an EPA brochure entitled “Protect your family from lead in your home”. The Maryland Lead Reduction Program is designed to eliminate the multi-million dollar law suits against landlords that have become common place in recent years. All rental property built before 1950 must be registered with the Maryland Department of the Environment unless it is “Certified Free of Lead-Based Paint”. Before renting a pre-1950 unit, the owner must have the unit inspected by a state accredited inspector who certifies that the unit is “safe” to rent based on the objective criteria established by State Law. Compliance allows the owner to (a) avoid fines for non-compliance, and (b) obtain limited liability in the event an at-risk person has an elevated level of lead in their blood stream. Units built between 1950 and 1978 have the option of participating in a program that limits the owner’s liability in the event a person at risk has an elevated level of lead in their blood stream. If your property was built before 1950, we register it with the Maryland Department of the Environment. If built between 1950 and 1978, we assist the owner in assessing the risk and options to reduce liability. Legal and environmental specialists are available to assist in this process. Contractors and Environmental testers are engaged to perform work, tests, and inspections to comply with the program. Owners benefit from our volume purchasing power with reduced inspection costs and reduced replacement window costs. Our leasing staff is equipped to provide all necessary disclosures and documentation to comply with all regulations and, ultimately, reduce the owner’s risk. An additional benefit: housing is safer for children so fewer children become poisoned by lead.